I think Squaw has more snow now than it did in January. Snow or sun? Ski or surf? Can't this girl make up her mind? I know, I know. Yesterday I'm writing about summer and I'm back to the skiing. And it's May. And you packed your skis in the closet (that's what I did over the weekend...finally!) and hung up your ski pass until next season. And you're thinking riding, running, hiking, golfing, tramming--all the activities you can do in ski country once the snow melts. The Ski Channel was all over this awesome news: Aspen Mountain is re-opening for Memorial Day Weekend. Most of the terrain will be served by the Ajax chairlift, but that still means 71 inches of snow and 25 runs. And if the weather holds out, the mountain has plans to stay open additional weekends in June. Squaw Valley USA has one final weekend left of its momentous season--guess that's what happens when you get a 7-foot snowfall, roughly, in a short period, and then the clouds continued to open and leave snow dumps. 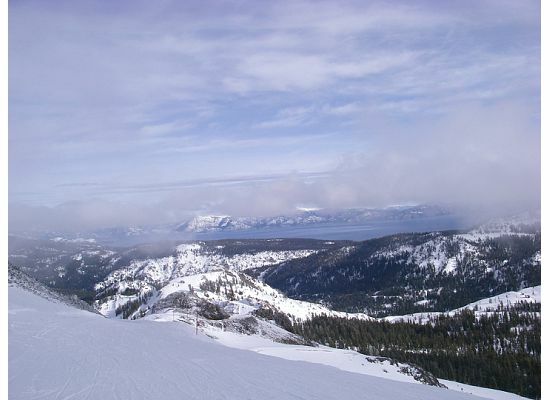 Squaw is open May 27-30 and conditions will hopefully allow skiing from KT-22, Headwall and High Camp. Plus the Tour of California has cleared out of the area so you really don't have an excuse not to go. And if the rest of the fam or group doesn't want to ski, book lodging through the Resort at Squaw Creek and they'll have plenty of activities to keep them busy (or three hot tubs to soak in) while you're on the slopes. Plenty of folks who live in the L.A. area who ski are likely planning Memorial Day weekends in Mammoth--the rain that's been falling along the California coast can only signal snow for Mammoth Mountain, adding even more to the already huge snow total for the year. I've seen people skiing in the Tetons on July 1, but that required arising early and hiking to the top of the trail with skis in tow. Forget the hike and the one run and make it a day on the mountain at Alpine Meadows, which is reopening specially for the Fourth of July weekend. Buy lift tickets in advance and you can save $10 off the ticket window price--and score entrance to skiing plus plenty of parties, base activities and Independence Day fun. Arapahoe Basin is showing no signs of slowing down for the season. They have a 105-inch base, snow in the forecast and nearly two feet of snow in the last few days. And what's better than The Beach when it's almost summer? Snowbird's still been seeing snow, too. In fact, they had so much snow the other day that they actually couldn't open the mountain because the snow coupled with warm temperatures made it dangerous for skiers and snowboarders. The 'Bird is closed thru Thursday, May 26, but they'll reopen for Memorial Day Weekend on Friday, weather dependent. Not too bad considering other Utah resorts nearby are closed, some for more than a month. If you thought Vancouver was beautiful this time of year, Blackcomb's open terrain is another reason to head to British Columbia. Operations at Blackcomb usually stay open later than its connected neighbor Whistler but this year they extended the season longer to max out the ski conditions. But you'll have to ski before you hike and bike in Stanley Park--Blackcomb closes on May 30. I guess it helps when a ski resort is planted near Mt. Rainier--Crystal Mountain is open on weekends until the snow melts (their words, not mine). That might take a while too--the mountain weather is still in the 30s and 40s and the snow base totals are at 92 inches at the base and 140 inches at the summit. Ah, Oregon, why do you always have ski operations that continue through the summer? What does a dormant volcano that other ski spots don't have? I'll take it though because it means Mt. Bachelor and Timberline are still open for taking turns. Bachelor closes on May 29, but Timberline closes full-time operations on May 30 and then has its summer ski season May 31 through Labor Day. Can I just say that's where I'd want to be a camper, forget canoeing and swimming. See? There really is reason to keep with the skiing. That is if you're not battered and bruised like I am--likely worsened by my last ski trip to Vail on its closing weekend, but a weekend I wouldn't trade for a second. Aspen Mountain is available in 1888-mammoth Further Details : Mammoth vacation rentals Refer :" Peter Macro "